I don’t care if Mohammed al-Mussaed, aka Green Tea, and his likes call me a rafidi because the opinion of extremists is not of value to me. Now of course people like him would argue that “rafidi” is not meant as a sectarian slur but merely a description, but to me as well as many others this term has very negative connotations because it has been used for a very long time to degrade the group of Muslims to which I belong. But as I said, I could not care less. What I care about, though, is how the government treat those so-called “rafida.” I expect our government to treat all citizens with justice and equality. This is what King Abdullah promised this nation, “a land of justice and moderation far removed from hatred and extremism.” And I still vividly remember his first speech as a King when he vowed justice for all. This form bears the logo of the Ministry of Health and it is used by the directorate of health affairs in Ahssa for those who apply for a job at government’s hospitals. 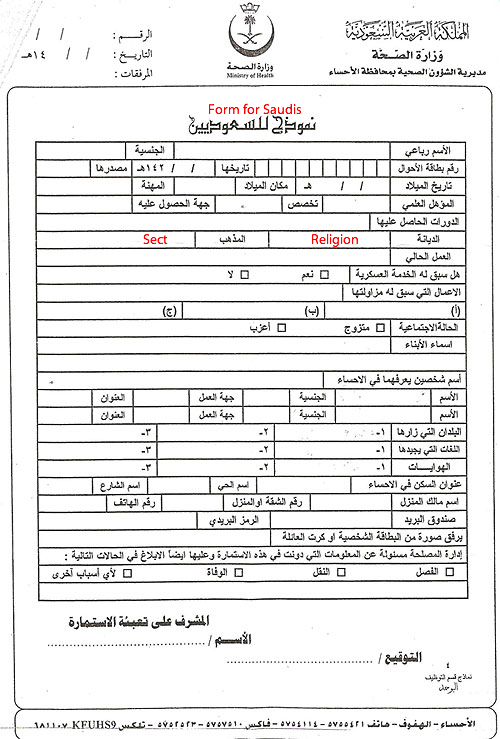 The headline in this form clearly states: “Form for Saudis.” However, a few lines underneath that title there is a space where applicants are required to provide their religion and sect. So what’s going on here? Is this form only used in Ahssa or is it used throughout the Kingdom? I don’t know, but I can confirm that this form is not fake because I personally know someone who had to fill it when he applied for a job. I have heard many people talk about sectarian discrimination at the healthcare sector in my hometown of Ahssa, but as a good citizen I always choose to ignore them and believe the government who insist that they don’t discriminate on sectarian basis. I would like to think that there no such thing as institutionalized discrimination here, but I think there are some individuals who use their power to pass discriminatory practices. In this era of sectarian strife that is taking the region, it is high time for our nation to eliminate all practices conveying prejudices and for the government to take strong measures to stop discrimination on all levels. It is only with unity and solidarity that we are able to stand and overcome the challenges facing our country. Now let’s put the words into action. This Post was posted in Blogging, Human Rights, News, Politics, Saudi Arabia and tagged ahssa, equality, Healthcare, hofuf, justice, king abdullah, moh, shia, shiites. Bookmark the permalink. Don’t they ask for sect in KSA when they make a Census for example ? Isn’t that very naive? How many Shi’ite army officers are there in Saudi-Arabia? How about Shi’ite ambassadors, governors or mayors? And how about Saudis who convert to other religions like Christianity? There’s plenty of institutionalized discrimination in Saudi Arabia. Ask anyone who has a red iqama in his pocket. Am Muslim but just an expat here in Oman : if am not mistaken, friends here told me that police ask when doing their ID card but I think is just a way to keep record . The majority remains Ibadhi, even though I have the feeling they enlarge official numbers . Now more than ever, is a political problem : Iraq and Iran might move the balance from Sunni to Shia dominions and no one wants it . Monitoring the sect identity [but do people always answer the truth when they fill those forms ?] is another way to monitor events on a larger scale . weird, we all know that its there, but its the first time i see it officially! I’m surprised it’s actually written, considering that most Hasawis can readily identify “Sunni-ness” or “Shia-ness” based on names and/or physical appearances anyway. No doubt if someone were to leave it blank or write “N/A” on it, it just wouldn’t be processed and the applicant would remain unemployed and forced to take the same route so many Shia have long taken…self-employment. For my entire life, I’ve never seen a form like this. I think it’s only in Ahassa .. There is no form like this in Saudi Arabia, and this is the first time I see such like this. It is photoshop picture. Please do not mislead people here. So, please respect your reader and be good to your country. Naif: just because it’s the first time you see such thing doesn’t mean it’s not been there, unless you work for the human resources department in Ahssa health affairs directorate of course. In that case, maybe you can bring us the real un-photoshoped form. As I said in the post, I personally know someone who filled this form in the procedure of applying for a job. I’m honestly surprised that people are surprised!!! This issue has always been Saudi Arabia’s elephant-in-the-living-room that no one wants to talk about. We have openly discussed every issue facing this country, except for the plight of our Shi’ite brothers and sisters over the past few decades. The bottom line is that, unfortunately, Shi’ites are second-class citizens that do NOT enjoy the same rights and privileges from the government as Sunnis. Has there ever been a Shi’ite Minister, Ambassador, court judge, Shoura Council Member, Army officer, or even a university dean? They are deliberately kept away from any/all positions of influence in this country. I think that we all remember the incident a few months ago with the “Qatif Girl”. Let me impose a hypothetical question on everyone. Do you think that we would have gotten the same initial court ruling if the girl was from Qasim and rapists were from Qatif? I guarantee you that, in such a hypothetical case, the girl would never have been on trial and the men would have been beheaded at the soonest opportunity. When will people wake up and realize that discrimination is alive and thriving in this country? Unless this issue is openly discussed, I believe that it will keep growing until boils up. On the other hand, I see that one your readers wants you to “respect your reader and be good to your country”. I guess this is his way of telling you to put up with it and SHUT UP!!! The way I and those who understand Arabic read it, the form is titled “Form for Saudis”. Why would you imply anything else?! Would you please explain why you named the post “Form for the Other Saudis”?!! Furthermore, we do have major sectarian discrimination in Saudi, just like we have tribal discrimination, but I do not see anything wrong with asking for ones sect! Most of the forms I filled in the United States asked for my ethnic background and religion. For all we know the directorate of health affairs in Ahssa has been instructed to be fair to Shiites, and they are using this field as a proof that they have met the required quota of Shiite employees when asked by King Abdullah’s Divan (Royal Court). By the way, I remember reading in the “About” section of your blog the question and answer below! And I was pleased to see that we are approaching country matters from a citizen’s perspective, regardless of our sect. However, such a post would lead you to lose credibility, at least in my eyes! Don’t get me wrong I don’t have any problem of you standing up for your people. But not from the same place where you trash Sunni controlled sectors like the judicial system and CPVPV. Finally, I truly hope that no minority in Saudi is discriminated against. But, not in away where the majority lose their identity. Abdullah: the way this form is designed has given me the impression that it’s not for all Saudis. That’s why the title. I don’t mind asking for sect if it was a standard procedure followed in all dealings with the government. I don’t know anything about a Shia quota, but I think that jobs should be given based on skills and merits, not religious background or was6a. I’m not standing up for my people here. My people are the people of Saudi Arabia, no matter what their background is and I believe that all citizen should be equal before the law and in the eyes of the government. Moreover, I don’t criticize the judicial system and CPVPV because they are Sunni-controlled. I criticize them because they are committing gross violations on basic human rights. Should Shia-controlled organizations in Saudi Arabia (do such thing exist btw?) commit similar violations, rest assured that I won’t refrain from criticizing them. Heck, I will be even more harsh on them! I do share your hopes for a better future, and I thank you for enriching the conversation with your levelheaded comment. ‘Why shouldn’t I?’ he asked. I said: “Die, heretic scum,” and pushed him off. Ahmed, may be you should ask yourself first: what is the meaning of Saudi? Are you guys Saudis as you pretend? I doubt it. You know what I mean. They keep you thinking that you are all Saudis and have same rights for all. Nonsense. All of you are not Saudis, just Qahtanis, or Ormanis, or Otaybis or whatever. 1. It is illegal to ask the religion question on any form. Please substantiate with a sample form. 2. The ethnic background boxes are for statistical/consensus purpose and are optional. 1. Forgive me, my statement was misinforming! It is illegal to ask religion related questions on the US Government forms. However, I do remember writing down “Islam” or “Muslim” on multiple occasions! I tried to look online for a sample form, but did not find any. 2. As far as the ethnic background field, it is not only used for statistical/census purposes. It is also used to satisfy the affirmative action policies. I agree that many Saudis struggle with their identity and in many occasions question if Saudis; All Saudis are treated the same and equal. Yet, I cannot be other than that as long as I belong to this country. I’ll belong to Saudi Arabia as long as I am alive. I really really do not care what we are called but I care more that we keep being one united country. The continuity of being one “real” nation is one true challenge ahead of us. Not many Saudis take this as an issue. They feel more comfortable within their other identities they belong to. Future generations will face tougher times answering that challenge. ِِِA lot of discrimination here in Saudi is based on lack of knowledge and ignorance, in the work places as I’ve witnessed it is not only against Shiite Muslims but also against women, expats from other poor countries and even Sunni of liberal appearance or ideology or vice versa depending on the management. I think that a person can’t ignore his own sect, gender or beliefs when it comes to promotion of ideas, everyone of us will be biased to what he/ she is subjected to, so yes I think you can’t ignore the fact that you are moved by this form because you are a Shiite Muslim, and there’s absolutely nothing wrong with that. I get moved a lot by forms of discrimination against women and that doesn’t make me my opinion unbiased, I think the first step toward enlightening others of whatever wrong they’re doing is by expressing it out loud, otherwise, things will never change. I for instance was trying to find a census on death records for an academic work that I’m doing but couldn’t find any, so I don’t really think the form was trying to conduct any meaningful census, I think Abdullah is just an optimistic person, but my own guessing is that this question on sect was placed after certain incident, we don’t usually find a sect question, but in this particular case, a staff at the ministry forms department may give you the origin of this trend. I’m sure some staff did something that caused the checking of the sect. Hi,,good article as usual, this is my first time commenting on one of your articles. Yes we have some discriminatons in all levels not only the Sheia vs Sunnah…but I believe things are getting better….what we should do as educated young people is to try to move on and ignore these things and work on reaching to each others (I am sunni from Riyadh)…I remember When I was doing my Bsc in King Saud University, I tried to make friends with some sheiah students but I always somehow got rejected from them..they are so suspecious of me although I wasn’t relegious and I never discussed any sensitive conversations…..
my friend, I am currently doing PhD overseas and i have a lot of experience in dealing with so many people from various backgrounds…. I have many Iranian (Sheiah) friends here in Canada. One of them once told me that sunni Iranians have no right to join the army, no chance to have highly excutive jobs or even being in Police…so sunna in Iran are suffering a lot more than Sheiah in Saudia…i am not saying things here is perfect but there are so many places where minorities are treated like crabs…Hopefully with more people getting educated overseas and with less relegious controling of the primary education and controling of young children in Mosques or Hozat , we could have less single minded people. I know sunni guys when they see a sheia man think he is the one who killed Omar …I know Sheiah guys when they see a sunni man think he is the one who killed Ali…all of this products is a result of the feedings of shaiks and Ait Allahs….It is a dead past and we should forget about it. I were in Jeddah for training at the airport and in the permission form you have to fill your sec . But United States is a secular country , while Saudi Arabia is not. No matter what religion or sect you hold, you are treated based on merits. Ali Al-Naimi the oil minister is a shii. They’re very presumptuous, there is a growing group of non-muslim Saudis. It must be frustrating for them, not being recognized. Anyway, I’m sorry to say that from what I hear, there is a hell of a lot of discrimination base on sect. So shameful. Does anyone know if this happens in other khaliji countries? Who told that Ali Alnoaimi is a Shiite ?